Stories and movies of the WWII and the campaign in the Pacific have special significance in my life, since my birthplace is Guam. As history shows, Guam, a United States territory, was taken by the Japanese Imperial Forces the same time as the Pearl Harbor attack. That occupation brought unspeakable horrors to the people of Guam , including my mother and father’s families. This included slave labor camps,. forced prostitution and concentration camps. During the liberation of Guam,. thousands of brave U.S. servicemen lost their lives on the beaches of the island in the recapture of it from the enemy. 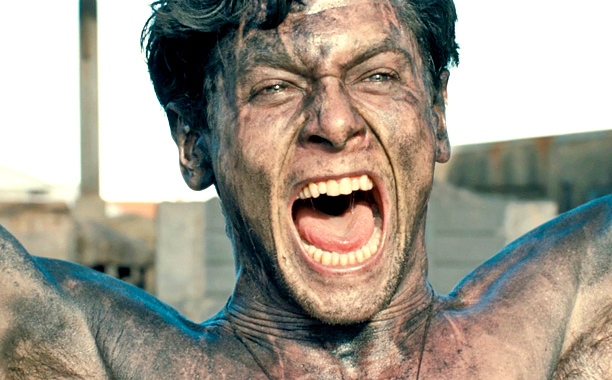 The movie, Unbroken, brought back , all the stories told to me by my parents and grandparents. It is a beautiful movie in that through the horror of war you see these heroes stand strong against impossible odds. The movie tells of a young officer who in a search and rescue mission, along with his squadron, find their plane malfunctioning and crashing into the sea. With only he and one survivor, they are rescued by the Japanese after a harrowing ordeal on open sea. They are incarcerated in a POW Camp in Japan. The head of the camp is also maniacal and has picked the young man to harassed and beat mercilessly because , he is an American Olympic winning athlete, Louis Zamperini ( played wondrously by Jack O’Connell). O’Connel deserves all the actor nominations that can be given out for his performance. Bravo! The movie also deserves the same accolades. Definitely one of the best of 2014. The film does not spare the audience the horrific visual treatment put upon him and the prisoners by their captors. I wept. It was perhaps not only because of the moving performances but also by the stories told by my progenitors. War brings out the worst atrocities that humans can bring to each other. This true story shows how the human spirit can survive the worst and emerge even better. As the credits rolled at the end of the movie, and it showed what Louis did after he was freed from the camp. it said that rather than choose revenge , he chose forgiveness. He actually ran with the Olympic torch in his 80’s in Tokyo. A hero.